This 4 Door Luxury Sedan has an extended body, leather interior and 8 inches of extra legroom. It is equipped with reading lights, rear vanity mirrors, and GPS. 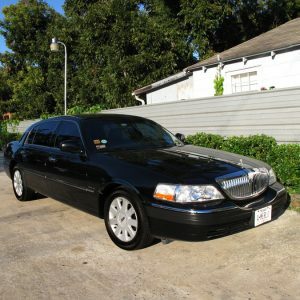 Sedans are ideal for airport transfers, wedding pickup, graduation, prom date pickup, date night, girls night out, birthday parties, and anniversaries. Call or email today to reserve one of our sedans as luxury transportation for your event or special evening! This vehicle features comfortable leather seats, CD player, rear stereo control, and dual air. It also has a spacious trunk making it a perfect choice for transporting a group with luggage. SUVs are ideal for airport transfers, wedding pickup, graduation, prom date pickup, date night, girls night out, birthday parties, and anniversaries. Call or email today to reserve one of our SUVs for your transportation needs! The Executive Van is perfect for transporting a medium sized group in comfort and style. It is equipped with leather seats, a CD player, built in TV with DVD player, aisle seating, bus entry door, and a spacious luggage area. 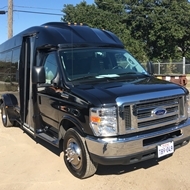 Executive Vans are ideal for use as a company coach, company transportation, airport shuttle, group tours, trips to Galveston, casino trips, flight crew transfers, and church group trips. 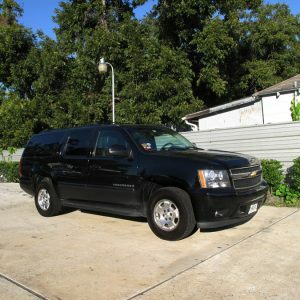 Call or email today to reserve one of our Executive Vans for your transportation needs! Our shuttle buses are designed to move groups efficiently. They are equipped with seatbelts for safety. Shuttle buses are ideal for employee transfers, airport transfers, and parking lot to office shuttle. Call or email today to see how our shuttle services can assist your company! Our minibuses are equipped to move large groups safely and comfortably. They feature a CD player, TV with DVD player (on some), PA system, high-back reclining seats, overhead luggage compartments, and 3-point seatbelts. 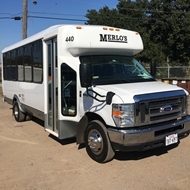 Minibuses are ideal for use as a company coach, group tours, trips to Galveston, casino trips, flight crew transfers, group hotel pickup, business meetings, and church group trips. 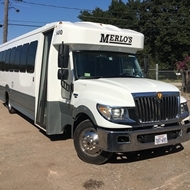 Call or email today to reserve one of our minibuses for your transportation needs! Our luxury motor coaches feature 5 TVs, DVD players, restroom, and seating for large groups with luggage. 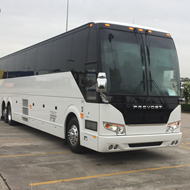 Motor coaches are ideal for overnight large group trips, large group transfers, trips to Dallas, Austin, New Orleans and other cities. Call or email today to reserve one of our motor coaches for your transportation needs!